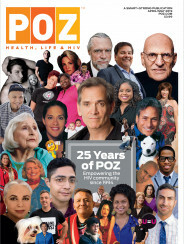 Daniel F. Cardone is no stranger to life with HIV—he has been living with the virus for more than two decades—but he felt the experiences of long-term survivors were being marginalized. To document that history, he picked up a video camera and began recording the stories of men in his hometown of Palm Springs, California. The resulting film, Desert Migration, has been playing at festivals and various special events, such as a benefit for the San Antonio AIDS Foundation, for several months. A DVD release and streaming options are slated for later this summer and early fall (for more details, visit the film’s website here). In the meantime, POZ spoke with Cardone about why the film is important and how audiences are reacting. And we include a gallery of photos and quotes from the men of Desert Migration. What is your personal connection to this story, and what drew you do it? After I moved to Palm Springs in 2010, I’d met many people who were long-term survivors. I’ve been HIV positive for over 20 years, but my experience was very different from a lot of them. Most of them were literally on death’s door, and even when that threat faded into the distance, they had to rebuild their whole lives. They lost their friends, they lost their jobs and they lost their homes. I realized that their stories were conspicuously lacking from the public HIV conversation at that time. Their lives had been saved by the introduction of protease inhibitors, but their new lives were utterly different, often quite compromised and fraught with complications. They were the very first generation of people living long term with HIV and dependent on very strong medications. There have been brilliant films like We Were Here and How to Survive a Plague, but in 2013, when I began this process, there was nothing really about what has happened to people who lived through this. So I wanted to do something that looked at their situation through a philosophical lens, almost a meditation on aging and purpose. I’d worked with producer Marc Smolowitz earlier on his film Still Around, which was created for his nonprofit, The HIV Story Project. When I approached him with this idea and the test footage, he was very excited. Marc was already aware of a growing zeitgeist across the nation and the world that was focusing on long-term survivors and aging with HIV, and [he understood] that we had the opportunity to create the very first comprehensive feature documentary dealing with this important subject. Why is this story important to document? When I began, I really did feel like long-term survivors had been marginalized. There was a general feeling that they’d been told to “Sit down and shut up. You’ve got your pills, you’re still alive, what more do you want?” All the trauma and grief, not to mention chronic health issues people still endured, were pushed to the sidelines. It is vitally important that we record our history, that we retell and remember it. As HIV-positive people, as people in the LGBT community, as humans, we need to remember what has happened and to acknowledge where we have been, or we will make the same mistakes. Understanding history gives us a greater perspective on life and amplifies our compassion. Through telling this particular story, which is now thankfully a much larger part of the conversation around HIV/AIDS, we acknowledge what older generations have been through, we honor their experience and loss, and we also help release the burden of grief. It also helps fight stigma in a very real way by personalizing the AIDS crisis and by encouraging people to not be ashamed and to not accept someone else’s judgment of them. What do you hope the viewers take away from the film? We’re all going to face difficulties and infirmities as we age. My personal belief is that the choice is ours as to how we deal with the challenges life presents us. The challenge Desert Migration presents to an audience is: How do you choose to live your life? And how do you make those choices in the face of growing older, losing friends and not feeling as good as you used to. The overall theme of the film is finding that resilience and strength to go on choosing actions that make your life a more positive place to be. What was the most surprising thing about the HIV epidemic that you learned while making this film? On a very personal level, I realized how lucky I’d been. I received my diagnosis in 1995. I was living in Adelaide, Australia, and while I was in a gay relationship, I didn’t have a whole lot of gay friends and certainly no one who had actually been directly affected by this. 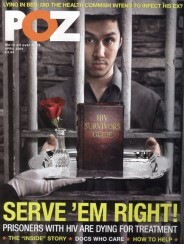 My doctor, whom I saw regularly, happened to be one of the state’s foremost authorities on HIV/AIDS, so I was very lucky that I received the diagnosis from him, because he immediately put me at ease. At that particular time, the approach was to get tested every three months, and if your viral load was consistently low and your T-cells were at a certain level, they wouldn’t put you on medication. For that I’m thankful, because I missed any of the meds that might have had harmful side effects at that time. So getting to put myself in someone else’s shoes made me so incredibly grateful for what I do have and what I miraculously missed. It also made me feel very privileged that they entrusted me to take their stories and share them with the world. What has been the reaction from folks who have seen Desert Migration? The best part of any screening has been talking with the audience afterward. Hearing people’s personal journeys and having them feel like they have been represented in some way by this film is extremely gratifying and humbling. I think audiences have been surprised at what an emotional journey the film takes them on. A common refrain has been that people who had lived through the early years of the epidemic didn’t want to see it because they didn’t want to revisit that time in their memory. But they’re pleasantly surprised that while we touch on that, the film stays in the present and looks toward the future. It is a cathartic experience. A single film can’t be all things to all people—I don’t claim that this is the definitive long-term survivor film. I hope there are many more! But our goal with this film was to get people thinking and to stimulate larger conversations about the issues it touches on: aging, isolation, access to health care, long-term care, substance abuse, mental health and intimate relationships. That’s why we are taking Desert Migration out into communities by creating events where the film can be a springboard to launch conversations that are specific to locations and address the concerns of those aging with HIV in those areas. We want the viewers to start talking about what is important to them. Publicly sharing our experiences is a very important part of preventing isolation, reducing stigma and building healthy communities. 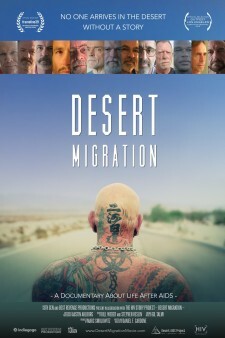 For more information, including updates on screenings and releases, visit DesertMigrationMovie.com or the film’s Facebook page.